Jamie Peri Peri chicken thigh skewers l had to try and they were a success,the flavour of the peri peri worked and they were lovely with a salad. We brought these alongside other meat for a BBQ! We cooked them, making sure to turn them sufficiently, so as to cook them evenly. They tasted lovely, they had been throughly coated in Peri sauce and you taste the spices! Not something we’d buy on a regular bases but definitely for when we feel like something different! 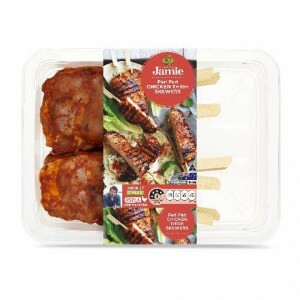 How would you rate Created With Jamie Peri Peri Chicken Thigh Skewers?